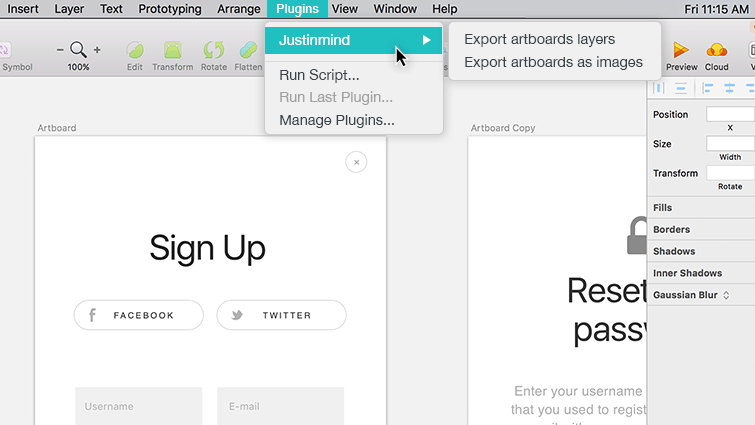 Justinmind is integrated with vector graphics editor and design tool Sketch. 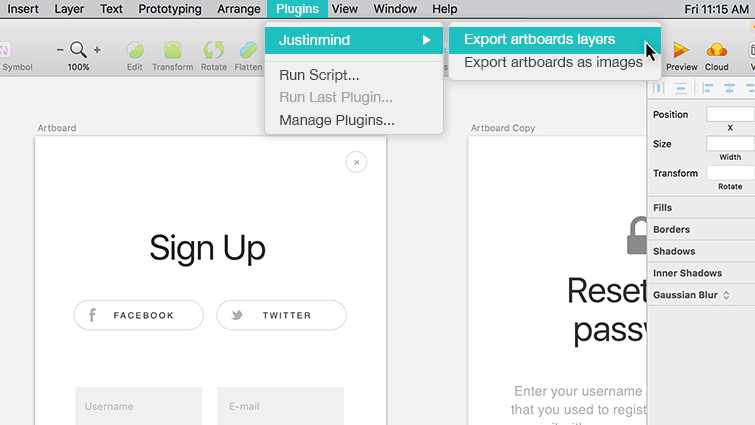 With this integration, you can create fully-functional, interactive prototypes from your Sketch artboards and customize them in Justinmind. 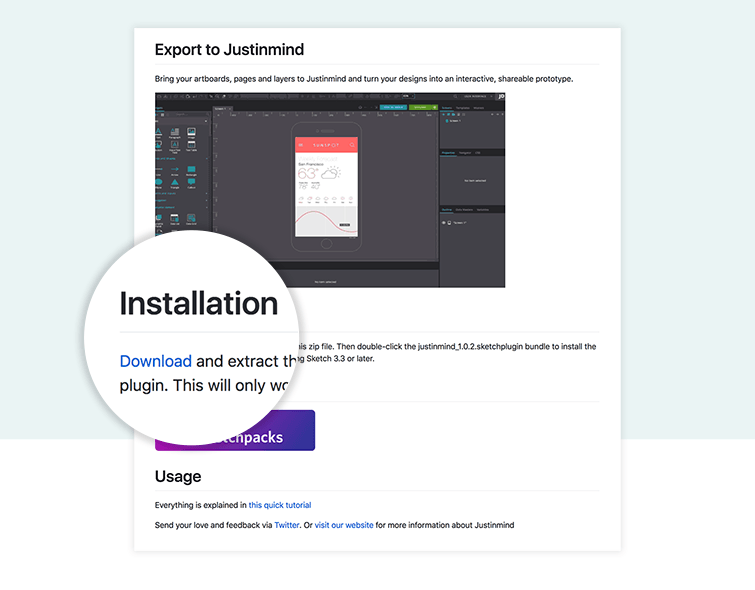 Download the Justinmind plug-in for Sketch here and follow the steps below to get started. Once downloaded, unzip and double-click the “.sketchplugin” file to install. Note that you will need a working Sketch account and Sketch downloaded on your computer to make use of this integration. 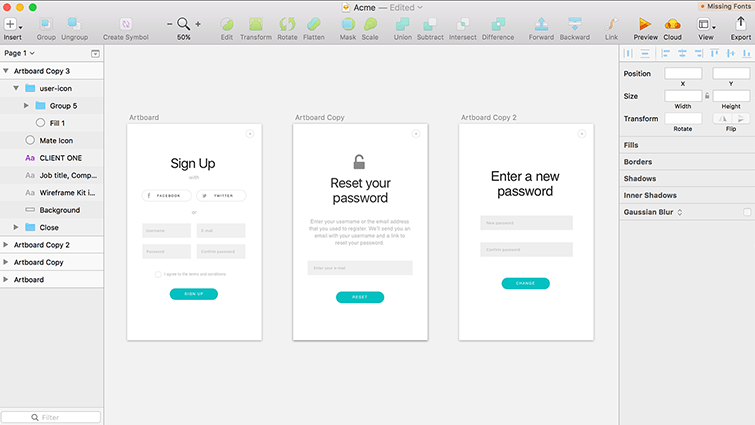 Choose a prototype device to export your artboards to. Portrait and landscape options are also available for mobile and tablet devices. 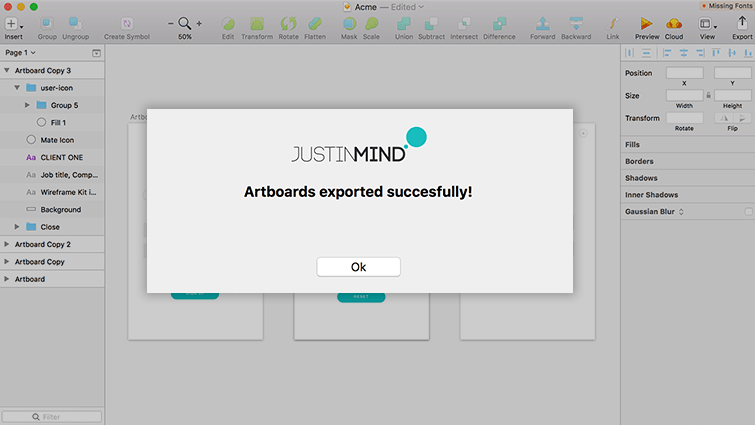 With your selection made, click “Export” to export your artboard(s) to Justinmind. Choose a location within your folders to save your exported artboard(s). The file type will be “.vp” – a Justinmind file. 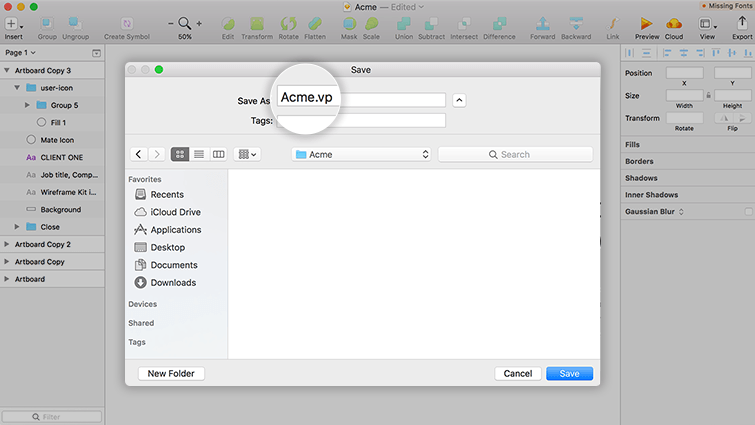 Locate your .vp file and double click it to open it in Justinmind. Then, follow the process above. Open Justinmind. From the dialog that appears, select the “Open a prototype” option. 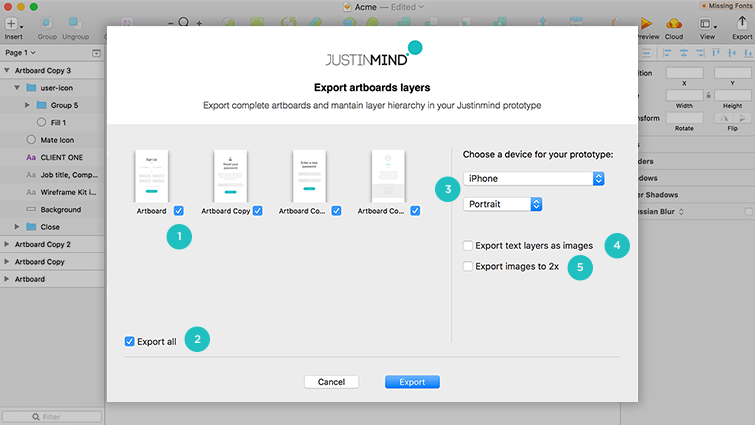 In the next dialog, choose your Justinmind .vp file that contains your exported Sketch artboard(s). With your file selected, click “Open”. 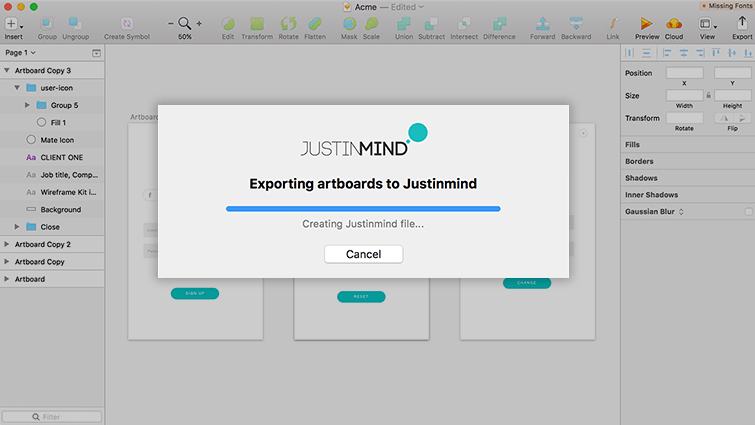 Your Justinmind prototype will open in the canvas. With your prototype open, you can start customizing it. Note that if you have exported your artboards as layers, you will be able to edit individual elements and add interaction to them. However, if you have exported your artboards as images, you will only be able to add interaction to each screen, not individual elements. To edit text within your prototype, select a Text element on the canvas. You can either edit the text by double clicking on the Text element, or by going to the Properties palette and changing its “Value”. To edit the style (e.g. color, size, position) of an element on the canvas, simply select it on the canvas and go to the Properties palette. For instance, to change the color of an element, go to the “Background” section of the Properties palette and either select a color from the color picker or enter the HEX color code. 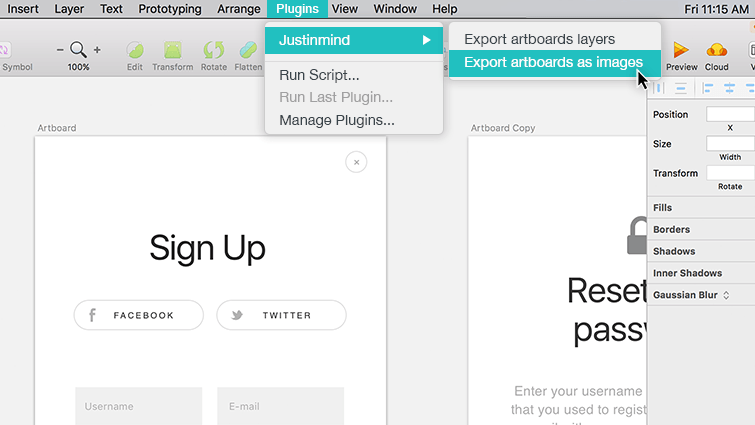 To add interaction to an element, you’ll need to use Justinmind’s events. Select the element on the canvas and go to the Events palette. Click the “Add Event” button. In the dialog that appears, select an event trigger and an action, select the target element, add a transition effect below (optional) and click “OK”. Learn more about working with events and interactions here. If you have exported your artboards as images, you cannot edit the visual design of your prototype’s screen because each screen is made up of a single image. You can however, add interaction(s) to a screen using the Hotspot widget. To add interaction to a screen made up of a single image, drag a Hotspot widget (from the Navigation section of the Basic widget library in the Widget library palette) and place it over the section of the screen you want to make interactive. Then, select the Hotspot on the canvas and go to the Events palette. Click the “Add Event” button. In the dialog that appears, select an event trigger and an action, select the target element, add a transition effect below (optional) and click “OK”. Note that you can add multiple Hotspots to one screen, so that different sections of the screen perform different interactions.